All you need to receive and watch Digital TV is a tuner and an antenna. New TVs made for the US market include a digital TV tuner (also called an ATSC tuner). If your current TV says it has ATSC support, you can watch digital TV directly this way. However, if you are used to a Tivo or Digital Video Recorder you will be really unhappy not being able to pause, record or place-shift your TV programming. The great news is that you can pick up an ATSC tuner for your computer really cheap and get started enjoying digital TV right away with all of the features you want. This works great on laptops as well (a great option for camping / travel). This is why I bought a tuner and later I was able to use it in my full featured Media PC project. 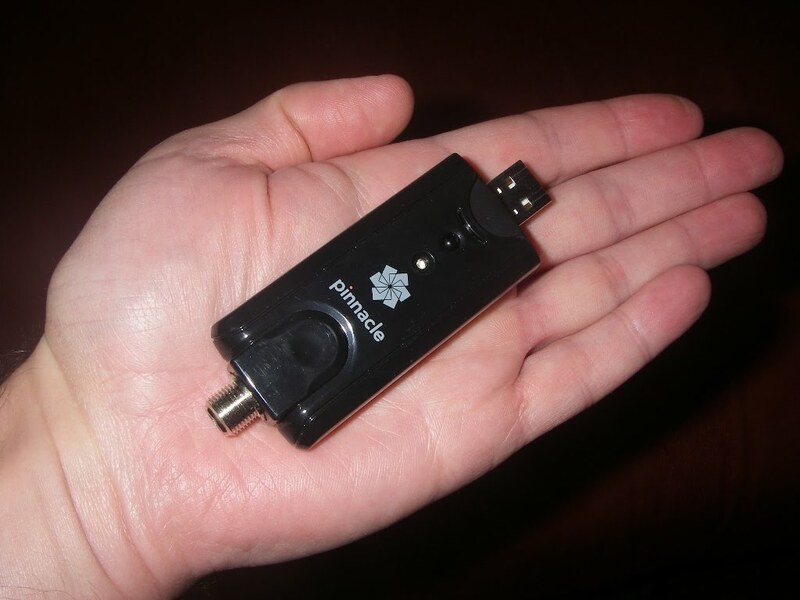 The pinnacle HD pro tuner comes with the tuner shown above (it is amazingly small). Just plug it into your usb port and connect the antenna cable to the other end. It also comes with everything else you might need: a mini-remote, small indoor antenna, and software to do basic recording / watching of TV. Perfect to get started and not too expensive. With the indoor antenna, as you'd expect, you can only get a few really strong stations. If you live near some broadcasting towers, you might be able to get a few more. The next thing I tried was hooking this up to an outdoor FM antenna that I had handy. An FM antenna is not idea, but since it is high up and outdoors it should do better (and it did!). I was amazed at how many TV stations were out there! I received almost 60 stations and this is with a cheap FM antenna. I began to wonder what I could do with a really good antenna. If you would like to read a little more about the Pinnacle PCTV HD, I cover it in more detail here. If you are going to build a multi-tuner Media PC, you have several options. You could buy multiple USB tuners or PCI (card) based tuners. There are also a few dual tuner PCI cards out there. However, one really flexible choice is to use an ethernet based TV tuner. There is a product called HDhomerun by SiliconDust that contains two TV tuners and sits on your ethernet network. It costs only about $120. The advantage of this is that you can have multiple computers that can share the tuners on your network. This might be a bit advanced for some, but many home power-users like this option. Plus, it has an IR receiver and might be particularly convenient for some installations. I haven't tried this out, but many people on other forums seem to like this product a lot and it works with Windows 7.